Texas coach Shaka Smart got a surprise post-game water bath. Seniors Dylan Osetkowski, Kerwin Roach both go out in style. NEW YORK — Eventually, the specifics about what happened this season in various outposts like Stillwater, Athens or Lubbock will fade into oblivion. How big were those leads against Michigan State and Baylor? What was the name of that dude who blocked the shot at Oklahoma? What happened on the final play at Kansas? All the answers will turn fuzzy, if not forgotten entirely. What happened this week at Madison Square Garden is another, more permanent story. Every Texas Longhorn that journeyed to New York will remember what happened this week in the NIT. The events of Thursday’s 81-66 win over Lipscomb will be filed and catalogued in one’s grey matter as if it’s the Library of Congress. Texas, a team that was wildly inconsistent throughout the regular season, somehow pulled together to win five games and the NIT championship. The Longhorns finished the year 21-16. It’s the program’s second NIT title; Texas also won the event in 1978. They’ll remember how Courtney Ramey’s lock-down defense just locked out Lipscomb sharp-shooter Garrison Mathews. Ramey said “it was an honor” to be tasked with such responsibility. He would have little to no help, as per the game plan. Mathews, who strolled in averaging 21.1 points, was 0-for-3 in the first half and didn’t score a bucket until there was 8:22 remaining. It was his ninth attempt. He finished with 15 harmless points on 2-for-10 shooting. And they’ll remember climbing the ladder and cutting down the net after winning the NIT. They’ll tell friends and family members about posing for a team photo in the New York Knicks locker room and spending the night out in the city that never sleeps. Still, Smart met with reporters wearing a NIT champions T-shirt while his soaked, white dress shirt was wadded up on the desk. The athletic director sure believes so. 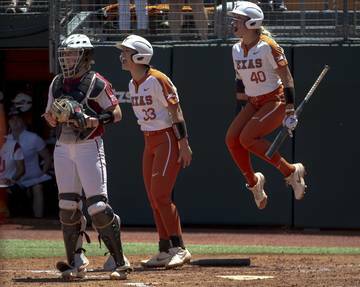 Most everyone will remember how Texas’ two seniors went out in a blaze of glory. Dylan Osetkowski had 19 points and hit three 3-pointers and grabbed 11 rebounds. His mother showed some awesome moves on the Dance Cam, so that’ll be a fun story around the holidays. Roach had 16 points and a career-high nine assists. A player that got suspended three times during his collegiate career, and arguably ran out of chances, made the most of his last one. Coleman, Ramey and Roach all made 3-pointers in the second half when Lipscomb got its mojo back after a rough first half. Then, Royce Hamm Jr., an energizer off the bench, had a dunk and Texas led 57-45. Speaking of Hamm, his first-half block must earn special notation. He practically jumped up and slapped Wilt Chamberlain’s banner to swat away Kenny Cooper’s layup attempt. By this point, the Bisons (29-8) were starting to talk smack to the Horns, the officials and just about anyone who would listen. Rob Marberry screamed profanities like a guy struggling at the rec center during lunch hour. And he still finished with a team-high 17 points. 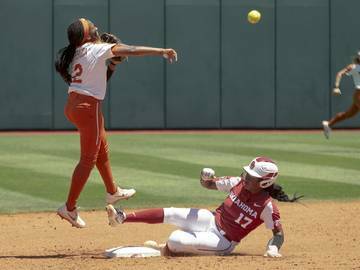 This time, when the opponent got momentum, Texas pushed back even harder. Coleman’s trey and Osetkowski’s easy jumper made it a 14-point game down the stretch. Coleman even drew a charge with 5:05 left, and even though this wasn’t UT’s season, you knew it was the Horns’ night. Roach’s incredible dunk with 2:33 left was just the capper.